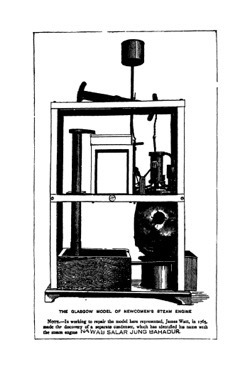 The plan of this book is the following* : — The first chapter contains a sketch of the steam engine as it existed in the time of Watt, together with an account of the ideas then prevalent as to the nature of heat, and concludes with a summary of some physical properties of steam. The second and third chapters are occupied by an investigation of the principles of the modern theory of heat in its appli cation to the steam engine. Then comes a chapter on the conversion of motion, which deals with certain salient points in the mechanism of an engine. The fifth chapter is mainly devoted to the expansion of steam, to the action of valves, and to the application of Watt’s indicator. The sixth chapter treats of boilers and the consumption of fuel. 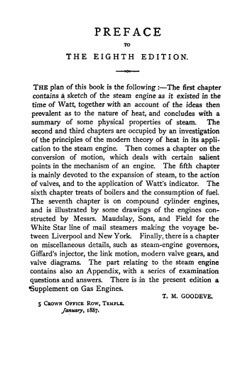 The seventh chapter is on compound cylinder engines, and is illustrated by some drawings of the engines con structed by Messrs. Maudslay, Sons, and Field for the White Star line of mail steamers making the voyage be tween Liverpool and New York. 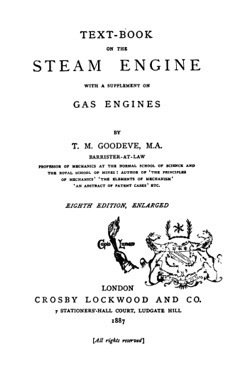 Finally, there is a chapter on miscellaneous details, such as steam-engine governors, Giffard’s injector, the link motion, modern valve gears, and valve diagrams. 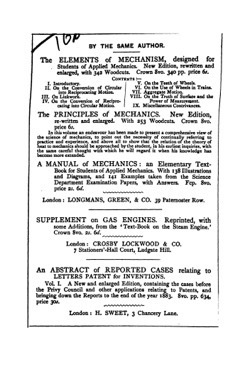 The part relating to the steam engine contains also an Appendix, with a series of examination questions and answers. There is in the present edition a Supplement on Gas Engines. S Crown Office Row, Temple.